What works for your brick-and-mortar store might not work the same way as your online business. While flash deals work divine online, you can hardly represent your warm and friendly self when your clients are online. Nowadays, if someone comes across your products or services, they expect you to be online so that they can order directly from you, or at the least connect with you (via your website) to browse your products or services at their own pace. This is a statistic I came across HubSpot (an inbound marketing and sales platform that helps companies attract visitors, convert leads, and close customers). So, true fact. Enough said. Google, Yahoo, Bing, and other search engines work every day to catalog, test, verify, and sometimes even ban websites all across the world to bring the best of information to anyone who can get online. Using search engine optimization (SEO) tactics helps these search engines know your business (and you) exist and consequently inform the interested end-user about you. You can talk about your lunch. You can talk about your dead pet. Or better yet, talk about your products and/or services on social media to let people know who you are and why investing in your products/services will be good for everyone involved. Sometimes just being active online helps a potential customer remember you when they eventually need your services. SEO is a continuous process, just like you workout everyday to stay fit. Keeping your website optimized with the latest search engine suggestions and recommendations keeps you in good standing with the search engine giants, and that usually means you appear in the top 2 pages of the keyword of your choice. 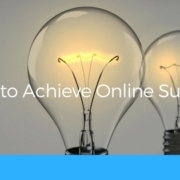 What are you doing to achieve online success? Do share!